The Catholic Peacebuilding Network (CPN) is a voluntary network of practitioners and academics, clergy and laity, which seeks to enhance the study and practice of Catholic peacebuilding in areas torn by conflict. It is comprised of 23 affiliated organizations, but also works with many other individual and institutional partners worldwide. As a Catholic network, CPN believes that authentic and effective peacebuilding involves dialogue and collaboration with those of other religious traditions and all those committed to building a more just and peaceful world. This site is hosted by the Secretariat of CPN, which is housed at the University of Notre Dame’s Kroc Institute for International Peace Studies in the Keough School of Global Affairs. "Catholic Approaches to Transitional Justice and Reconciliation"
A new publication from CPN with CRS and the Kroc Instituite, “Catholic Approaches to Transitional Justice and Reconciliation Processes: Guidelines for Reflection and Planning” is a tool for those working in post-conflict situations and trying to engage transitional justice and reconciliation in a distinctively Catholic way. 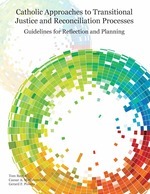 The document offers an understanding of transitional justice and reconciliation through the lens of Catholic tradition; highlights lessons learned from worldwide Catholic engagement; provides guidance on project design, evaluation, and assessment; and includes a comprehensive list of global resources for further learning. It does not prescribe recipes for action, but gathers a diversity of on-the-ground learning and experience that can be adapted and utilized by Catholic peacebuilders as they discern, plan, and evaluate action for transitional justice and reconciliation in specific contexts.